Read this Comprehensive Veggie Bullet Reviews Before You Buy One! After massive success with their bullet blender series, Nutribullet decided to join in food preparation market by launched Veggie Bullet which designed to spiralize, slice and shred vegetables. We have tested and used several Nutribullet blenders and feature their reviews from time to time. Check our Nutribullet Pro 900 blender review here. So, it was intuitional to find out how this kitchen appliance would compare with other forms of food ingredient processor appliances regarding performance, efficiency, and quality. Without further ado, if you are wondering whether Veggie Bullet a good deal for you? Let’s reveal the truth. So what Veggie Bullet designed to do? What are the alternative tools in the market? Before we start the discussion of Veggie Bullet review, let’s a little bit go backward. Those who occasionally made vegetable salads in the early and mid-90s must be familiar with the salad shooter . It was the only way one could make these salads conveniently back in those days. For those wondering what it looked like, it was ordinarily a slicer/shredder with a handle, powered by battery or electricity and used for pointing and shooting vegetable ingredients straight into your salad dish. It was a convenient gadget to use back then! Since then, technology advancements in the field of blending have proven to be worthwhile. More manufacturers have added their products to the market that incorporate classic features. Nutribullet has expectedly joined the market with their usual conspicuousness and introduced the Veggie Bullet. This unit promises to offer a better experience, and those who specifically used salad shooter back in the days would relate. In reality, the main aim for Veggie Bullet is to try to capitalize on the growing obsession of vegetable spiralizers. And that explains why it also comes with a spiralizing attachment. Therefore, you get it rather easy to crank this device or even turn the vegetable through the blade to end up with your vegetable noodles. Probably, this could be one of the disturbing questions currently running through your mind as you read this article. 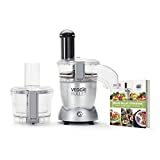 Veggie Bullet has a bulky physique that certainly gives you an impression of looks and function like a food processors. But that doesn’t however, imply that it’s an inferior unit either. In fact, the only vital attachment missing that is quite surprising is the processing blades for chopping. Otherwise, as we shall learn from the review, it is arguably one of the best appliances to have in your kitchen. So this awesome kitchen tools is meant to perform three key functions; to spiralize, to shred and to slice food ingredients. That’s what it’s specifically designed to do given that it can’t efficiently cut, grind, press food chips, blend and mix in a similar manner like most food processors do. It thus means that it can only be used for limited but effective on purposes like slicing carrots, shredding cheese, grating breadcrumbs and making zucchini spirals among others. The interest of many buyers often when shopping for this stuff revolves around the performance of the three key functions. It really makes perfect sense for you! The spiralizer is apparently the highly regarded unique feature that distinguishes the Veggie Bullet from other food processors. From the tests we did, we realized that the spiralizer feature on this kitchen tool somewhat works perfectly with particular types of vegetables. Zucchini and cucumber are some of the vegetable ingredients that the spiralizer works well with, and it does work pretty well also with relatively hard vegetable ingredients such as beets, carrots, and sweet potatoes, compared to softer vegetables. The varying user experiences about the spiralizer function ideally narrow down to the type of vegetables you are using and the manner you prepare the vegetables. They provide 4 different spiralizer blades options: Angel Hair Blade, Curly Fry Blade, Ribbon Blade, and Tornado Spiral Blade which allow you make an awesome spiralize ingredients for your recipes. Spiralizer Performance: Some will find it struggling to spiralize hard vegetables while others might find it to be just okay depending on how they prepare the vegetables apt for the feeder, as overall the spiralizer performance is very good. The Veggie Bullet also contains a shredder blade, which is primarily a disc that flips over to shred on one side and slice on the other end. This blade is specifically attached to shred some of the relatively hard food ingredients such as carrots, beets, cheeses, and meat among others. We all know that some vegetables tend to be bigger that the size of the chute. In that case what do you do? It’s simple, just make sure that you manually chop or cut the ingredients to the right size to fit appropriately in the chute. At times, when shredding, you might realize that food ingredients get stuck quite quickly in the spout. This one also depends on the type of ingredient you’re shredding. In most cases, it happens that it’s designed in a way that leaves a space between the blade and the lid. The slicer feature also uses same attachment with the shredder. The slicer and shredder blade flip over each other interchangeably. It slices quite a number of vegetable and fruits into smaller desirable pieces. The slicer does a wonderful job when slicing some of the hard vegetables and fruits including carrots, meat, and hard cheeses among others. The slices are perfect and come out like lightning. It is also a suitable function for those who prefer to process large quantity of food ingredients but necessarily don’t mind food ingredients sticking. When slicing, large food ingredients might fail to get through the spout. So just ensure that the ingredients are cut into smaller uniform pieces before slicing. But the auto-slicer feature is a perfect function of the this unit, actually better than its shredder feature. From a broad-spectrum, a fair amount of food might fail to make all the way through when shredding/slicing food ingredients. Consequently, the residue tend to rest on top of the spinning blade and cause a kinda horrendous experience. With all those features on Veggie Bullet make this unit is suitable for a specific category of people. And these people are those who often do their own vegetable salads, vegetable noodles, shredding cheeses and grinding nuts and other fruits and vegetables. This unit is suitable for the spiralizing regulars seeking a rather fast and more expedient means to prepare weeknight dinner. You often don’t get an auto-spiralizer that processes food ingredients in a uniform, fast and appealing manner like the Veggie Bullet. The users who’ll get the best out of this unit are those that will often use it to process soft vegetables. You see, all the three functions are pretty perfect for softer fruits and vegetables. If you’re one of them, this appliance must be something that will give you satisfactorily result. This appliance doesn’t require technical skills to operate so anyone in the family, who at the very least knows how to read can comfortably operate and use it to process vegetable salad. The fact that you get all the three functions in one is a plus for this appliance. So even if you don’t have a ready food processor, the shredder/slicer blades could come to your rescue and offer the much-needed help at that particular moment. This unit comes with two different bowls; one is designed for slicing and grating, and the other bowl is meant for the spiralizer. Most of its parts are dishwasher safer. In this case, you find it easy to wash them after use. You can store the supplied processing discs inside the processing bowls. The spiralizer lid is located at the center, so it’ll be able to stay in its position when open. You can buy other attachments separately. So you get the freedom to choose what feature you want and when to use it. You also get a comprehensive instructional manual with recipes and guides. Typically, some people would find spending the entire amount on purchasing this unit quite expensive. Because, they’re probably interested in only one or two of the features and not necessarily all. Furthermore, they’d also find the amount for purchasing the entire Veggie Bullet unit rather costly when their intention or need is to utilize only one function. If you’re this kind of a person, you don’t need to worry! There are appliances that you can choose that are dedicated to offer each particular function. As mentioned earlier, the spiralizer function is what ideally makes the this 3-in food processor outstanding. As a matter of essence, many people often mainly for the sake of its spiralizing ability. So if you’re one that merely looks for this feature in a food processor, then you can go for other options in the market. However, this depends on whether you prefer an automatic or manual functioning as well as other features such as different blades and slicing thickness. The good thing about choosing manual spiralizers is that they’ll allow you to get more control and ease of adjusting the thickness. A better manual spiralizer function alternative food processor to go for is the Spiralizer 5-Blade Vegetable Slicer. It gives you the best spiralizing experience at an affordable cost. For an automatic spiralizer option, the best option in the market currently to consider choosing is the Spiralizer Ultimate 7-Blade Vegetable Slicer. It’s fast and easy to create spirals and ribbons and also suitable for vegetable salads, zucchini noodles, apple tarts and curly fires among others. If you’re looking for a food processor that gives you better options in the form of shredder function, just know that you have a variety of options. Actually, this particular option can be replicated with many other food processors in the market. However, some of the best alternatives to go for in the market include the Presto 02970 Professional, which apparently has somewhat similar features like the Veggie Bullet including the chute only that it doesn’t spiralize. It is also affordable thus ideal for anyone working on a tight budget. It is arguably the ideal shredder function alternative to settle for when looking for one and some Ninja-all-in one series also provide better options. Just like the shredder feature, you can also get a wide variety of food processors in the market that give you slicer option. Most of the food processors available can actually be imitated to offer this particular feature. The Homedox Salad Maker Professional Electric Slicer Shredder is an ideal alternative for the slicer function. It offers almost all the functions that the Veggie Bullet provides and its reviews are relatively strong and so can be a better choice. The other additional advantage is that it is pretty affordable to purchase. Presto 02970 Professional Salad Shooter Electric Slicer/Shredder is also another unit giving you better slicing function option. Other than that, you may also choose to go for a number of Ninja blenders, which also have the accessories for performing this particular function. Necessarily, every individual is motivated to buy a specific unit that solves their needs. From our point of view though, purchasing a Veggie Blender is rather beneficial than buying single appliance for a particular task. When purchase this kitchen tools you get the 3-in-1 function, which is advantageous because you can always interchange the functions using the available attachments to obtain a particular one that you need at that time. It saves you time, conveniences and more expenses that you would otherwise incur in the overall food processing needs. Veggie Bullet might seem like a somewhat expensive acquisition but the truth of the matter is that it saves you more money and expediency in the long run. The efficiency and user experience that it offers is worth it!